Elizabeth Trinkaus Brings Us "Enough Already"! Join us for a discussion and signing on Tuesday January 22nd at 7:00pm of Enough Already! 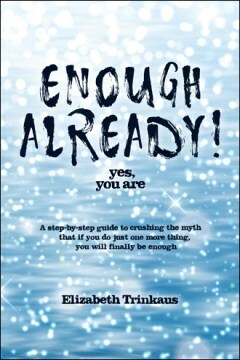 Yes, You Are: A Step-By-Step Guide to Crushing the Myth That If You Do Just One More Thing, You Will Finally Be Enough by Elizabeth Trinkaus. Elizabeth offers real-life solutions for you to get who you really are separate from what you have and do and provides step-by-step tools to help you live in the powerful present. Best of all: Enough Already! will have you living with more joy and satisfaction now, and will bring more creativity and inspiration to all those important dreams. So grab a comfy seat . . . this book is in your hands for a reason.